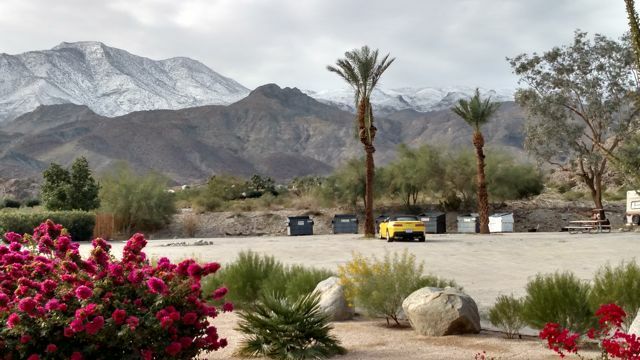 In contrast to the previous warm, dry winters, the Coachella Valley has had its more typical cooler temperatures during 2015-16 with precipitation bringing snow cover to the surrounding mountains. 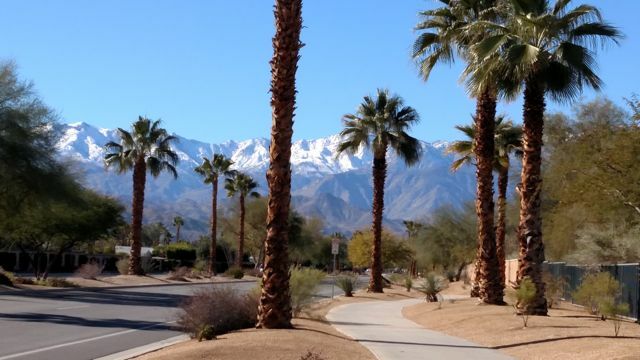 After the storms pass, the scenery of green palms, colorful desert vegetation, blue skies and white mountains beyond creates a spectacular riding viewscape. 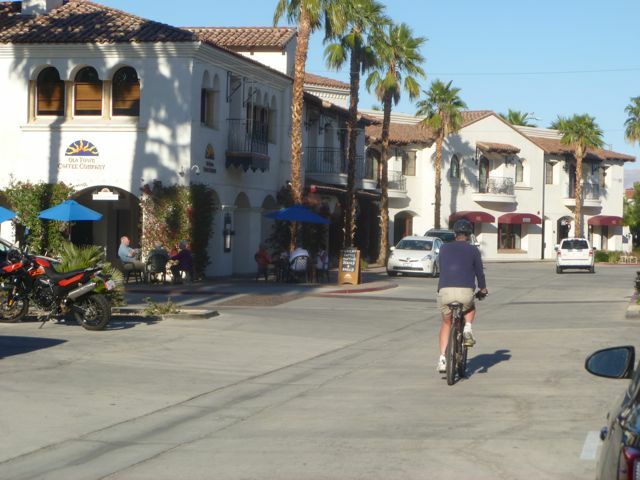 Following are photos from our bike rides around Palm Desert and Rancho Mirage, known in enCYCLEpedia as rides RM1, RM2 and PD1. Although these rides are mostly on the legal sidewalk ped/bike paths, the routes (except Hwy 111) typically have ample bike lanes for those that prefer. After the storm but before the clouds cleared, Steve poses along the Desert Willow path in Palm Desert . Lovely palm-lined pathway along Parkview Drive at Palm Desert Muni Park near College of the Desert. Along Frank Sinatra Dr in Palm Desert choose between a lovely landscaped ped/bike path or an ample bike lane. Frank Sinatra Dr in Rancho Mirage, where there are great sidewalk pathways as well as a bike lane. Bike bridge along the Hwy 111 path in Rancho Mirage, much safer than braving the adjacent highway that has no bike lanes. The bike path along Hwy 111 in Rancho Mirage passes the entrance to Thunderbird Heights, a community familiar to several presidents. 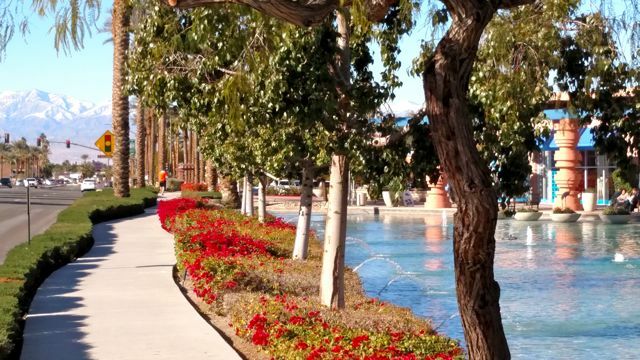 A pathway past The River dining/entertainment complex in Rancho Mirage. The Butler Abrams trail in Rancho Mirage. 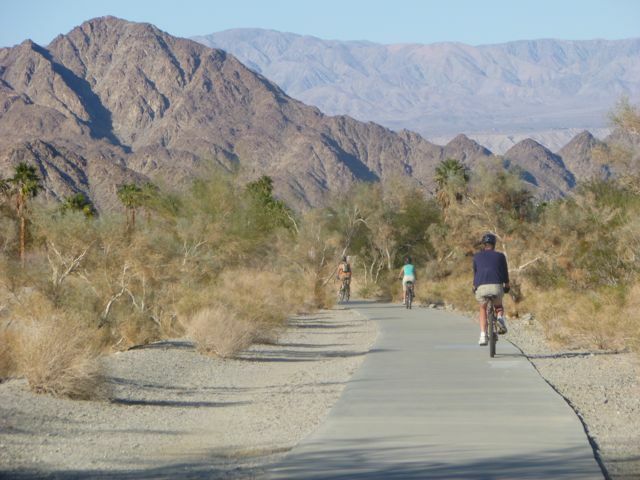 The planned CV Link trail will hopefully extend this path for 25 miles in either direction if Rancho Mirage does not block the plan as they are trying to do. 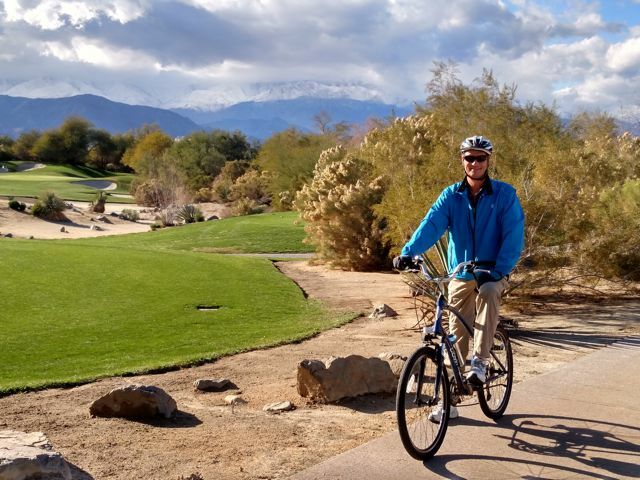 Known mostly for it’s world renowned golf country clubs like PGA West and La Quinta Country Club, La Quinta holds great interest for those of us who just like to cycle, dine, and enjoy the beauty of the outdoors. The charming new old town is a great place to come for your just reward from your bike ride – a delightful al fresco meal. Offerings include breakfast at Old Town Coffee, the wide variety of offerings at Stuft Pizza, or others that range from Mexican to seafood. 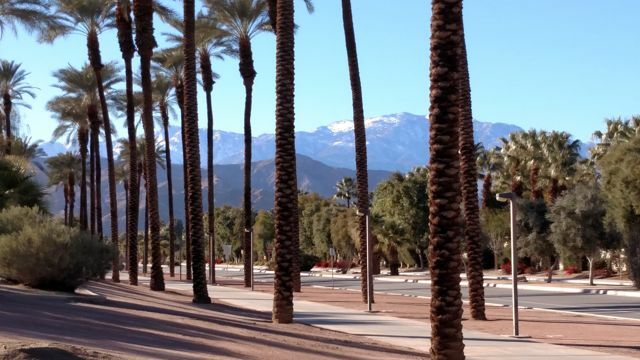 The highly regarded La Quinta Arts Festival is held at the adjacent Civic Center campus in early March. 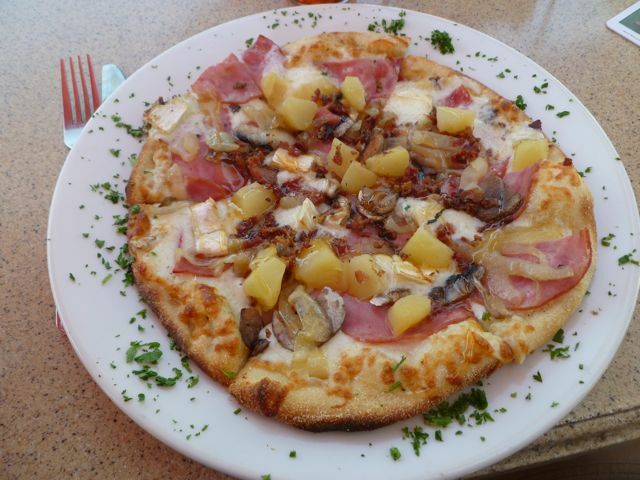 My personal favorite Bike ‘n Brunch reward is the Napa Valley Pizza on the Stuft Pizza patio. Pizza prices are reduced during Happy Hour (3-6). 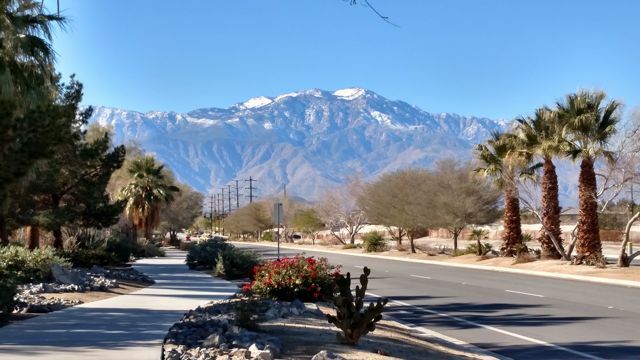 The Bear Creek Trail leads from just west of Old Town, parallel to the La Quinta Cove neighborhood, gradually rising 350 feet up to the foothills of the Santa Rosa Mountains. It’s perhaps the best Class I bike trail in the valley, even though it’s only 2 miles long. enCYCLEpedia ride LQ1 includes this trail and an exploration of Old Town, with some options to extend the ride. 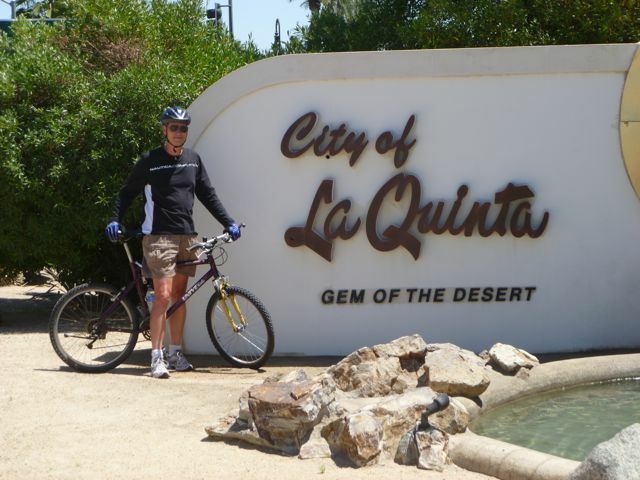 While La Quinta is the “Gem of the Desert,” we regard Lake Cahuilla Regional Park as the “Hidden Gem of the Desert.” It is reachable from Old Town by trying enCYCLEpedia ride LQ2, which can be done in the bike lanes or adjacent scenic sidewalks for those of us who prefer to stay away from those 4,000 pound machines whizzing by erratically. It is free to cycle in, but there is a nominal fee to drive in. 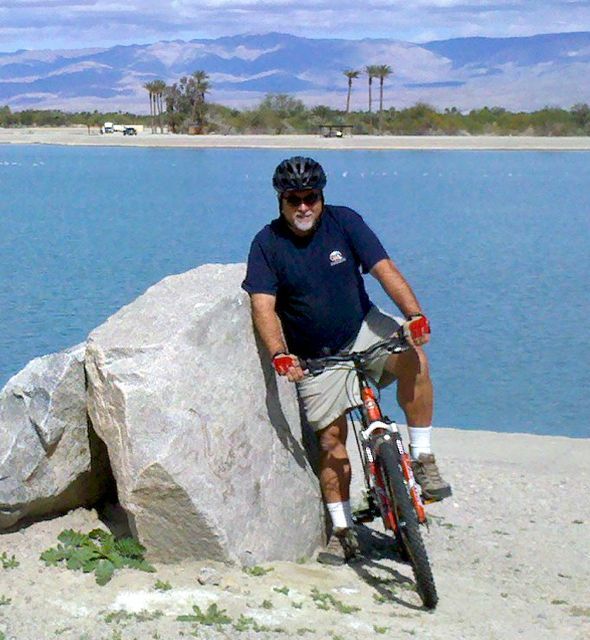 Lake Cahuilla is about the only lake that you can cycle next to in the valley. From the east and north ends the views of the Santa Rosa Mountains can be quite spectacular. You can’t ride all the way around it, but you can ride enough on both sides of it to get a variety of great vistas. The paths around the lake are gravel drives, best for hybrids or mountain bikes. There is also a concrete apron, but parts of it are frequently taken up by fishermen. If you enjoy birdwatching, this can one of the best places in the valley. 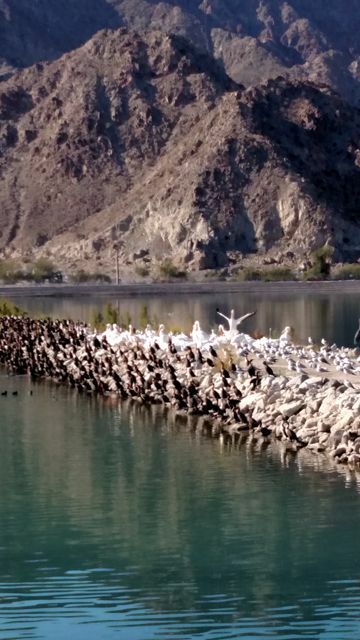 Shown here are a conglomeration of white pelicans, herons, gulls, cormorants and grebes on New Years Day 2015. They are going after the stocked fish in the lake, just as the fishermen do when they come here for the fishing derbies. 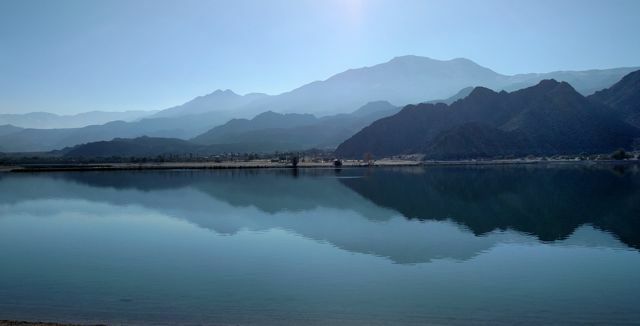 The Cove to Lake Trail (hike-only) runs 2.9 miles between the La Quinta Cove neighborhood and Lake Cahuilla park, with the trailhead to the west of the entrance kiosk. 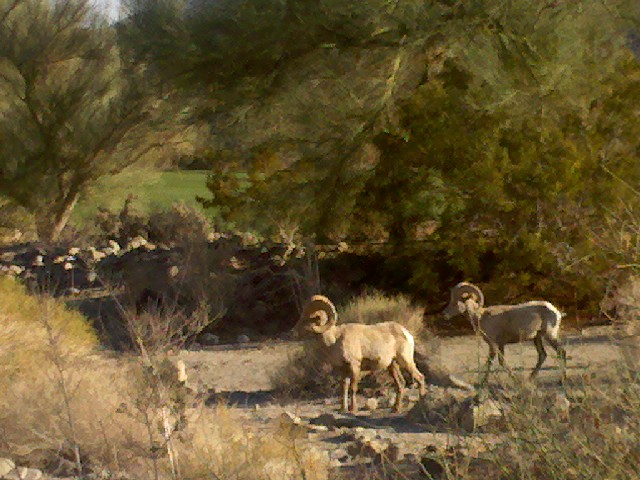 These endangered bighorn sheep sometimes visit the valley bottom, munching on desert vegetation and the grass at the adjacent private Quarry golf course. It makes for a nice Bike ‘n Hike ‘n Brunch experience! Beware though; where there is game there can be big cats who want them. 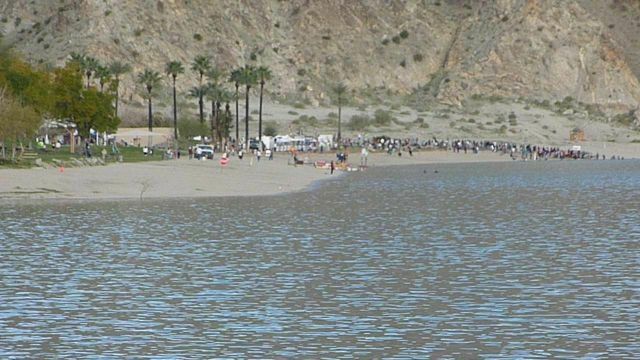 Swimming and private boats are not allowed in the reservoir, with the exception of the swim for the Desert Triathlon held in early March. The public park area features picnic areas, restrooms and seasonal facilities including a large swimming pool, boat rentals and refreshment stands. On Easter this park is overflowing, a tradition. The adjacent RV campground, which does not $gouge during the peak season like private ones do, is popular with snowbirds, making this a great Camp n’ Ride ‘n Brunch cycling experience. Even when it’s colder than normal, the viewscapes here can be wonderful. 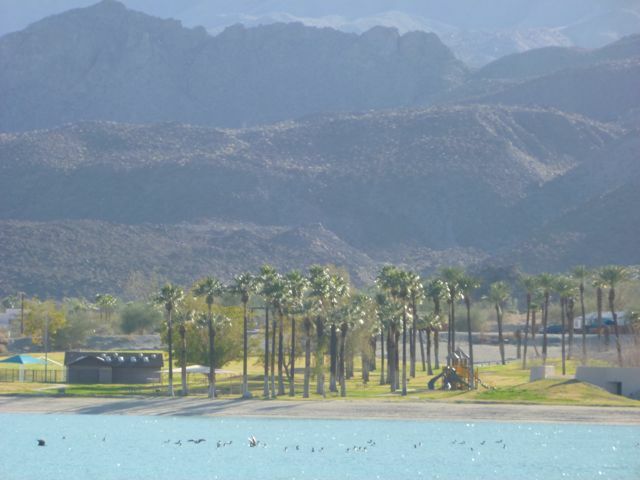 This is taken from the Lake Cahuilla entry kiosk.